In the meantime, as I was grabbing those said “few things”, I stumbled upon the area we all stop in…home decor. Some new items grabbed my attention and that’s what I’m sharing with you today. I am still on board (actually obsessed) with the macrame trend from last year. I am also digging the rattan we’re seeing everywhere. It reminds of carefree, boho beach style which is my absolute favorite. Fitst off, this plant stand. For under $60, I think it’s the perfect compliment to a small corner of your home. It also comes in a natural rattan color (not yet available online). I love the simple yet chic design of this throw pillow. Every year around this time I like to switch up my pillow game. I love everything in this room. The oversized lumbar makes this bed though. All the heart eyes. 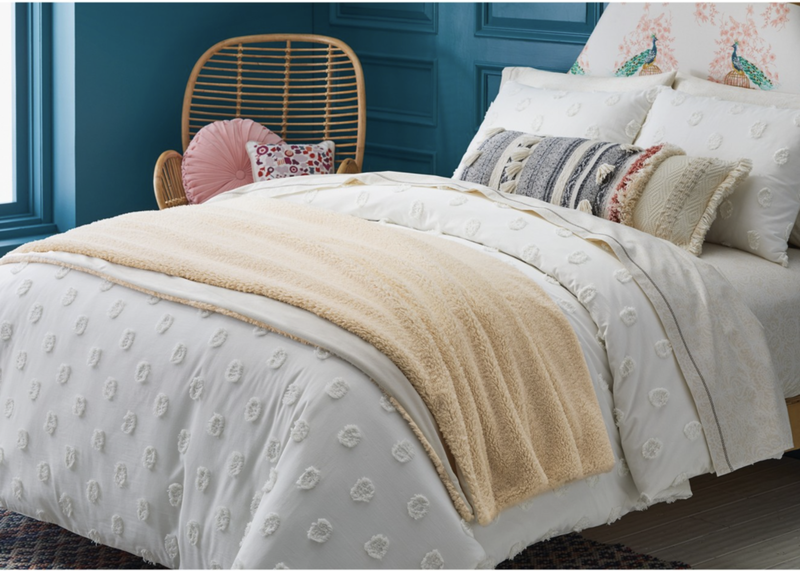 You can also find the cool rattan chair (on sale) here, as well as the duvet and headboard. Speaking of macrame, this simple wall decor is the perfect, yet subtle Valentine’s Day decor. This rug (on sale, today’s the last day) would be a nice way to add color to a room; great transition into spring/summer. It would also look great in a playroom or nursery. This mirror is such good quality! Perfect for an entry way for a quick check before you’re out the door. An inexpensive way to freshen up your home is to add plants. But, if you don’t have a green thumb (like me), you’re better off with faux. I have a few pieces from the amazing Hearth & Hand line. This eucalyptus plant below looks so real and I love the terra-cotta planter. 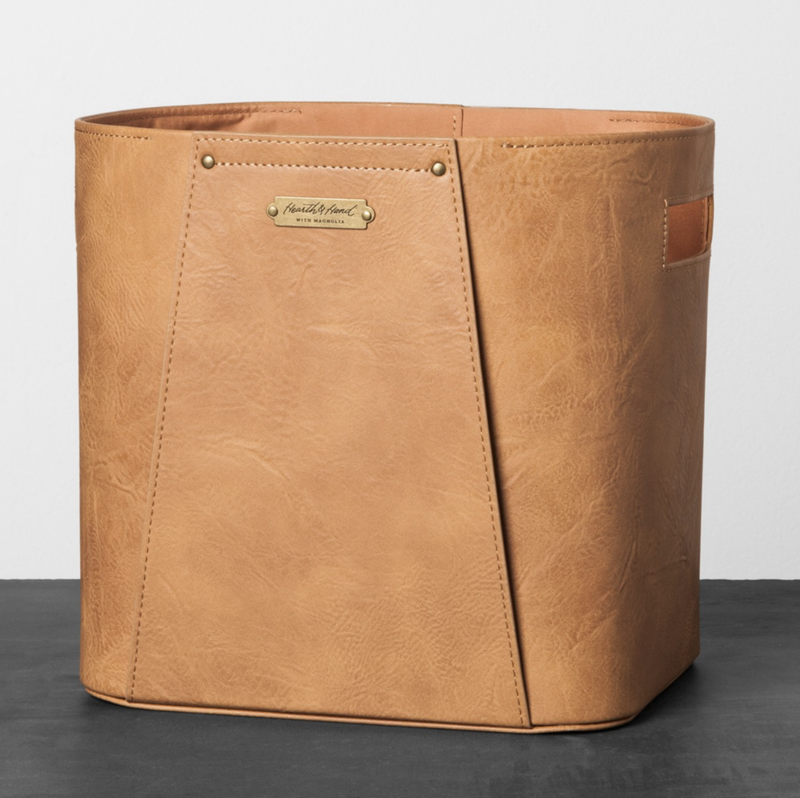 Lastly, for home decor, these tan leather storage bins are a perfect solution to clutter in the home office. Planning a spring getaway? How adorable is this one piece? Pink is THE color for spring. I might have to scoop this one up myself. Love this faux leather jacket. If I didn’t already own one I would have got this. Such a great price and super comfy. This blouse is adorable for Valentine’s Day. You could wear it paired with a pencil skirt for work, jeans and sneakers for daytime or dress it up with black Spanx and a faux fur vest for a dinner date. And….I am in love with this leopard jacket for the girls. My daughter needs this to match her mama. I love to leave you with a song…this one is from my friend and amazing yoga instructor, Amber. She plays the best music. I loved this song she played in class on Wednesday. It’s actually about 10 years old but new to me. Hope you enjoy!